The photo on the left shows members Members of the Harry S. Truman Chapter Color Guard team, presenting the Colors at a local Daughters of the American Revolution chapter Presidents Day 2007 event. The even was held at the statue of General George Washington, located at Washington Square Park in Downtown Kansas City, MO. The ceremony also included a wreath laying at the statute, Chaildren of the American Revolution quotes by members of the Corps Of Discovery, and various speeches by both D.A.R. and S.A.R. membersevent at the Weston Crown Hotel in downtown Kansas City, MO on Thursday, March 8, 2007. Major General Robert. L. Grover, Color Guard Commander, Captain James L. Scott and Compatriot Dirk A. Stapleton are shown here presenting the Colors. The photo on the right shows members Members of the Harry S. Truman Chapter Color Guard team, presenting the Colors at a local Daughters of the American Revolution chapter Presidents Day 2007 event. The even was held at the statue of General George Washington, located at Washington Square Park in Downtown Kansas City, MO. The ceremony also included a wreath laying at the statute, Chaildren of the American Revolution quotes by members of the Corps Of Discovery, and various speeches by both D.A.R. and S.A.R. membersevent at the Weston Crown Hotel in downtown Kansas City, MO on Thursday, March 8, 2007. Major General Robert. L. Grover, Color Guard Commander, Captain James L. Scott and Compatriot Dirk A. Stapleton are shown here presenting the Colors. 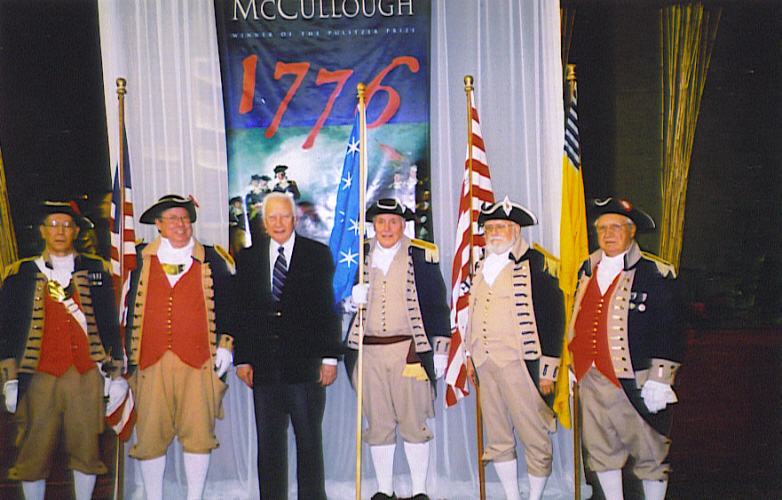 (Right Photo)L-R: Robert L. Grover Major General, James L. Scott Captain, David McCullough, Fred Kafenberger KSSSAR Color Guard Commander, Charles Goslin KSSSAR, Robert L. Lantz Captain Martin Warren Chapter.